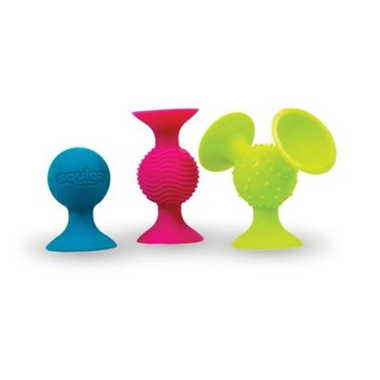 Sensory development is crucial for every infant and pipSquigz combine touch, sound, and visual stimulation all in one compact, take-anywhere, easy-to-clean toy! 100% safe and BPA free. 3 pieces per package. Gave these as a gift for a 1 year old and when I was told how popular they were by his parents I bought them for my 7 month old. She loves them! Strong suction cups and a great texture for her to chew on.